The basic parts of ARITHMETIC are as follows. Arithmetic helps find the answers to problems that involve numbers. Knowing the fundamentals of Arithmetic, problems with large numbers can easily be solved mentally. For example: Find the sum of 297 and 562. Imagine two stacks of 297 and 562 pennies. Transfer 3 pennies from the 562-penny stack to 297-penny stack. You now have two stacks of 300 and 559 pennies. This can be added quickly as 859 pennies. The first thing one learns in arithmetic is COUNTING. Counting helps one determine the number of things. A UNIT is what we count one at a time. Then we count one more each time as TWO, THREE, FOUR, etc. ZERO is absence of count. The abacus introduces grouping by PLACE VALUES. The abacus teaches counting numbers to BILLIONS and more. Numbers are made up of DIGITS, just like words are made up of letters. The digits in a number have place values of ONES, TENS, HUNDREDS, etc. 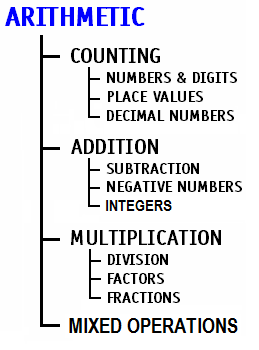 The place values may be expanded to provide DECIMAL NUMBERS. Raise 3 fingers on hand and 2 fingers on the other. You count them together as 5 fingers. This is ADDITION. To add mentally one needs the knowledge of numbers and place values. The opposite of addition is SUBTRACTION. If you get money, you add it to what you already have; when you give money away, then you subtract it from what you have. The two actions are opposite to each other. A Number Line helps display numbers relative to each other. It helps with mental addition and subtraction. Skill in mental addition makes it easy to acquire skill in mental subtraction. With subtraction we get NEGATIVE NUMBERS. With negative numbers we get a wider concept of numbers as INTEGERS. The integers appear on a number line on both sides of zero. If you sell 5 books for $6 each, you receive $30. This is MULTIPLICATION. Skill with mental multiplication depends on the earlier skill with mental addition. The opposite of multiplication is DIVISION. If you collect $6 each from 5 people, you get $30. If you distribute $30 equally among 5 people, then each person gets $6. The two actions are exactly opposite of each other. Skill in mental multiplication makes it easy to acquire skill in mental division. Multiplication and Division are greatly assisted by the concept of FACTORS. With division we get FRACTIONS. Multiplication has the priority when mixed with Addition. Multiplication and division are higher order operations compared to addition and subtraction.